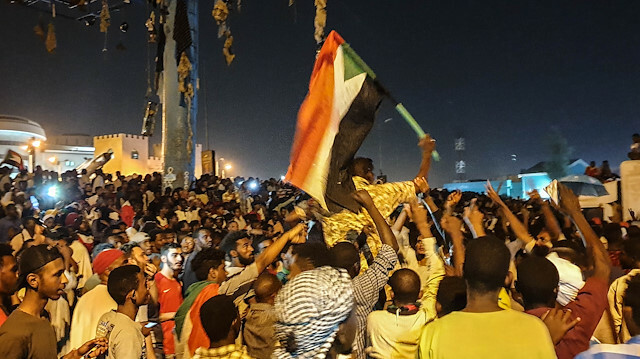 Sudanese opposition groups linked to the “Declaration of Freedom and Change” on Saturday demanded that power be handed to a civilian government. Protests and strikes will continue until that takes place, the umbrella organization said in a declaration. The removal of Omar al-Bashir from the presidency, the resignation of Defense Minister Awad Ibn Auf, who became head of the transitional military council, and the appointment of Abdel Fattah Burhan as the council’s new chief are far from satisfying the opposition. The declaration stated that Ibn Auf’s resignation emerged “under pressure of the revolution” and protests would continue until the old regime is ousted. Referring to Sudan’s Armed Forces, the declaration pointed out that “changing faces” would never be accepted and urged the army to guarantee the transfer of the country’s administration to a transitional civilian government. The declaration called for the arbitrary decisions to be canceled and figures affiliated with the former regime be tried in a fair manner. The Sudanese Professionals Association, Nidaa al-Sudan, National Consensus Alliance and Unionist Gathering were among those that issued the declaration. Ibn Auf, speaking as head of the transitional military council on April 11, said the army had gained control of the nation’s administration and a two-year long transition period had begun. He resigned from his post within a matter of hours, however, and announced Lieutenant General Abdel Fattah Burhan as his successor, who then assumed the position and was sworn in.